Lots of adults don’t have any nap time, or we might think of it as a luxury. That might apply on us, but that definitely doesn’t apply on our babies. Napping is very important for baby’s development, learning, immunity, mood and not being over tired. If your baby is having the needed amount of naps, he will be sleeping better at night and you as a result will be a happier rested parent. Many books and articles suggest following a fixed schedule for your children’s day (waking up, feeding, napping and sleeping). Unfortunately, that never worked for me. It is hard to stay on schedule all the time if you are planning to go out and perform other activities. Others can easily and successfully keep their children on a fixed schedule. Not all children are the same, and their naps might vary. But, mostly this is what I found best and recommend. As a newborn your baby will be sleeping most of the day, with time and as your child grows the number of naps needed will be less. I never had a fixed schedule for my baby, but he always gives me signs that he needs to have his nap such as yawning, rubbing eyes or ears, fatigue and crankiness. At this stage your baby will have the greatest number of naps in his entire life. Newborns mostly will be having four to five naps a day that will last from one to three hours. Some of them sleep 30 minutes then wake up for a feed or a diaper change then might sleep for another three hours. At this stage they just sleep, wake up, feed and repeat it all over again. Children at this age will need around three naps which may last to one and a half hour. At this age they start to become more interactive with the world around them. So, there naps become less and their wake up time more. 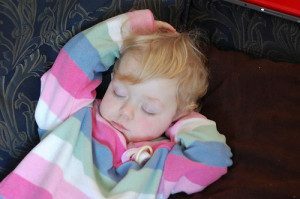 Infants start reducing the number of their naps at this stage to reach two naps which may last to two hours. Some babies still have a third catnap at this age, others don’t. And also this may vary from one day to another. Sometimes they sleep more at night so there nap time is less and of course vice versa. Your child will make a transition to one nap a day and it will be enough for him and its duration can take up to three hours. Don’t worry about transitioning your baby to a certain number of naps as he grows, that will happen naturally and he will be having the number of naps that keeps him alert and happy when he is ready to do it. In the transition phase, you may notice that your child’s bed time has been affected. With time his body will adjust with the new change. Share with us how does your child nap, what problems face you and how did you handle them.